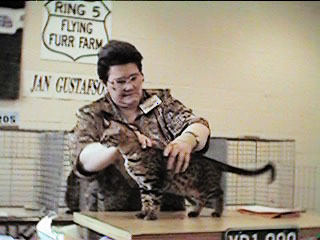 Cutter (Tejas Cut and Shoot) earned International Best Bengal for the '97 show season. Additionally, he was the Best Shorthair Cat in the South Central Region, and the 2nd best Allbreed Cat. Add to this his Best Bengal Kitten award, and 20 or so "Best Cats" and you have a very full show season. I know I said "Cutter's Show Season", but what is a photo album without a baby picture? Cutter is the back kitten, on the right. Even then, his pattern was very distinct, and his colors were exceptional. Lots of miles and lots of shows and sometimes the same old judges. 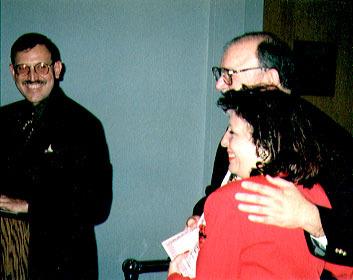 Joe Edwards and Cutter met in several shows, and became friends. Fate Mays, Don Caruthers and Lorre at the Regional Awards Banquet. Where do you go from here? Well, here is a picture of Tejas Cutter Quallah Tee, one of Cutter's fine daughters from 1998. 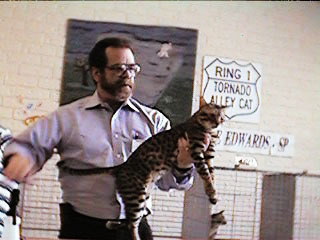 Quallah was the best Bengal Kitten in the SC Region and placed high Internationally, despite only being shown in only 4 shows. 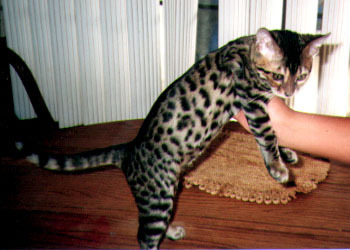 As an Adult, she was Second Best Bengal Alter Internationally, 1998. She was spayed, and lives her live happily as a family pet.